On Monday Blizzard didn’t so much nerf Warsong Commander as took her out back and shot her in the head. Twice. Just to be sure. Previously the card gave any minion which had less than 3 attack the ‘charge’ ability, enabling them to attack immediately, which led to degenerate mega damage combos in the Grim Patron Warrior deck. After a balance patch slated to go live next week the card will now only give minions which already have charge +1 attack. In practice that means Warsong Commander will go from being one of the most dangerous 3-mana creatures in Hearthstone to a card that’s worse than Raid Leader, a card itself considered dumpster tier unplayable. Perhaps surprisingly, given that the Hearthstone community has mostly been begging for a nerf to the Grim Patron deck in which Warsong Commander is a key component for over six months, there was quite a bit of consternation about the nerf, with many players arguing that a lighter touch could have been applied to reduce the card’s power without effectively destroying the entire deck archetype. This is the current version of the card. Next week she's unlikely to be see ever again. Perhaps she will go to live on a farm upstate and look after the Starving Buzzards there. 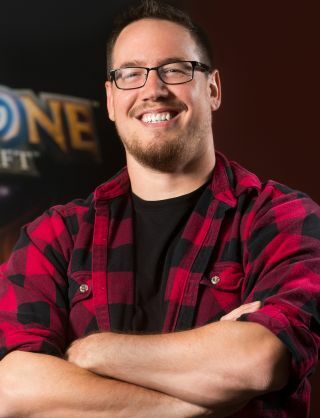 In response to that reaction, Hearthstone senior game designer Ben Brode has taken to video to explain the logic behind such a drastic nerf. In the video (embedded at the top of the page here) he reflects on the fact that Warsong Commander has long been a problem card, and the real mistake the design team made was not removing its charge-granting ability after it caused a previous problem with ludicrous Molten Giant-based one-turn-kills during the game’s beta.